Bee's mother is missing. She was her mother's shining achievement. She wouldn't just up and leave. Would she? So Bee goes through the evidence (a series of letters, faxes, emails, and official reports) that detail the last few weeks before her mother disappeared. But is it too little too late? Mostly told through email and correspondence, this is a super quick read. Bee is intelligent and loving, and Bernadette is lovingly intelligent and lost. They make a great pair. Witty, yet surprisingly realistic, Semple does a hilarious job detailing the pressures of home ownership and the difficulties of parent-teacher organizations. 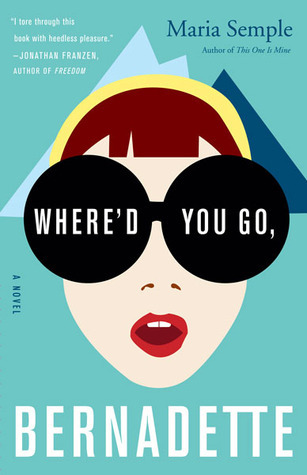 Other than the fact that I would NEVER want to be cornered by Bernadette (or work with her...or do anything that would anger her), the book was pretty cool. Weird. But pretty cool. What a strange book. The premise was strange, the setup was strange, and the characters were strange. But it's a good strange. 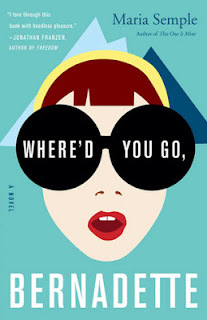 For a fun, fast-paced read with a quirky flare, pick up Where'd You Go, Bernadette by Maria Semple.